Most spinner luggage feels great to travel with, but unfortunately there are also some brands and models that cannot handle being used again and again. It's therefore super important that you consider the different choices carefully, so you don't end up choosing a bag that aren't worth the money. 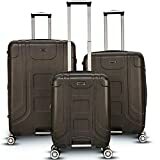 Having checked thousands of spinner luggage reviews, we can say that the Gabbiano Provence is the best choice for most people. The Gabbiano Provence got a rating of 4.70 out of 5, while the average rating in the list below is just 3.68. This is the best reviewed spinner luggage. We have checked 199,327 spinner luggage reviews, so we can show you the weighted average rating of all the bags. If the Gabbiano Provence isn't your style, you might also consider the Lojel Vita. The Vita is a close runner-up with a rating of 4.63 out of 5 - and it's usually cheaper than the Provence. The second-best reviewed spinner luggage. Finally, you might consider the American Tourister Marvel. The Marvel is the third-best rated spinner luggage with a rating of 4.51 - and it's usually cheaper than the Provence. The third-best reviewed spinner luggage. Below is the list of all top 111 best spinner luggage. Great if none of the three bags above are your style. PS: We have checked 199,327 reviews to make this top 111 list! How to Choose Spinner Luggage? Are you considering choosing spinner luggage? If so, you are about to choose a suitcase with a considerable number of advantages. However, if you really want a piece of luggage that is well-suited to you, you can’t simply head to the first option available to you. There are quite a few things about spinner suitcases that you may not be aware of. Well, that’s why we are here – this article can help you to decide if spinner luggage is for you as well as to pinpoint which the best option is. Here you will find all that you need to know regarding this topic so that you can make a properly informed decision. 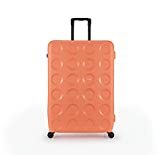 While spinner luggage is certainly becoming more commonplace among travelers, people do still have some reservations about this type of luggage. This, of course, is because this type of luggage can seem quite odd and there isn’t a lot of information available about them in one place. Well, this is all about to change with this guide. After going through this guide, you will be equipped with all of the knowledge that you need to go shopping for spinner luggage. Is Spinner Luggage Right for You? There are a lot of things that should factor into your decision about whether this is the type of luggage that is more suitable for you. This includes what kind of traveling that you are doing and what type of features that you hope to get out of your luggage. One of the main benefits of this type of luggage with wheels is that it is easier to move around with. First, it doesn’t require you to lift the weight of your baggage yourself. Since the suitcase has four wheels all you have to do is just push it around. This makes it a lot more comfortable to walk around with a heavy load. Now, the four wheels on spinner luggage spin in 360 degrees. This is why you will have no trouble turning the case sideways and then simply walking through narrow corridors or spaces. You will not have to tug on or struggle with your luggage thanks to this wheel formation. Then there is the fact that spinner luggage has great stability on flat surfaces. The four wheels provide the luggage with all of the support it needs so you really don’t need to hold it to prevent the bag from falling over. All of these features make spinner luggage quite perfect for walking around the airport. With this type of bag in hand, you will have no trouble at all moving quickly, even if you have a heavy case in hand. Conversely, one of the biggest issues that people have with spinner luggage is that, on occasion, it is not as durable as its two-wheeled counterpart. 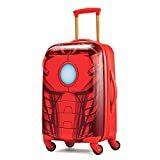 This is because, with spinner luggage, the wheels are attached to the exterior of the luggage. Because of this, they don’t have a great deal of protection and the wheels can snap off. Spinner luggage is also not great on slopes as it has a tendency to roll down, away from you. On a similar note, this type of luggage doesn’t work all that well on rough or cobbled surfaces, either and you may find it quite difficult to lug your bag. Also, while this doesn’t stand true for all spinner luggage, some bags do tend to be on the heavier side. Although you will not feel this weight while pushing the luggage around, it could prove to be a disadvantage when checking your bag in with the airline. So, if you are planning on journeying across rough countryside or go exploring suitcase in hand, then the spinner suitcase may not be for you. Wheeled Laptop Bags: These are largely used for business trips and are typically considered as carry on luggage. As the name suggests, the main purpose of this bag is to carry your laptop. However, there are compartments to store other devices as well as files and documents. Wheeled Duffel Bags: There are spinner duffel bags as well. The ones with four wheels are often slightly larger in capacity which is why that can work as checked luggage too. This type of luggage is both lightweight as well as very stable. Wheeled Suitcases: These are the most common types of spinner luggage. With spinner suitcases, you will need to choose between a soft case and a hard case. These type of cases are also available in various sizes – ranging from small to extra-large. As you can imagine, one of the most important aspects of spinner luggage is well, the wheels. So, just what is it that you need to know about these wheels? Wheels most commonly fall under the category of either ‘single’ or ‘double’ wheels. The benefit of double wheels is that they allow you to control the movement and direction of your luggage a little better. Therefore, they can be easier to maneuver. The main concern with spinner wheels is durability. This is because unlike the two-wheeled bags, the spinner wheels aren’t afforded all that much protection. Since the wheels aren’t recessed, they don’t have the case preventing them from getting damaged. This is why it is even more important for you to ensure that the wheels are made from strong materials that aren’t likely to break too quickly. To ensure that you can keep using the bag even if this does happen, you should look for wheels that can be replaced. The other debate when it comes to luggage wheels is the one between small and large wheels. Well, this one is fairly easy to settle – when in doubt, always choose the larger wheels. They will allow the suitcase to move more smoothly over surfaces because they don’t get stuck in ruts or small holes. Because the attachment system on spinner luggage is quite a bit different, you need to pay attention to the fixture in place. This will give your luggage greater durability and will help it last longer. This is why you should look for wheels that are attached with screws instead of those fixed with rivets. While a lot of the attention goes to wheels, handles play quite an important role in your spinner luggage as well. This is because it has to endure a lot of tugging and pulling as you roll around your bags. On top of this, the handle is constantly being pushed and pulled into place. Therefore, it is only a well-designed handle that will be able to handle all of this abuse. First and foremost, look for handles that have two bars supporting it on either side instead of just one in the middle. This is the first sign of a sturdy handle that will not break easily. Still, it is a good idea to give the handle a try beforehand. You will need to make sure that it does not wiggle while it is extended. Also, when the handled is retracted, where does it go? Does it tuck into the shell of the suitcase or does it descend and snuggle in the frame’s exterior? Usually, the handles that fit in the shell are the best option. Since they are protected, even when it is in transit, it has less of a chance of being damaged or worse, snapping off. Now, it may have come to your attention that luggage – suitcases, in particular – seem to have different shapes. What this is, really, is that the edges on these bags are different. Some have rounded edges while others have blunter, square edges. The main advantage of round edges is that they are less likely to get damaged. Even if they were to collide with another surface, it is unlikely that there will be too much harm done to your piece of luggage. What the squared edged bag offers you instead of protection is storage space. The square edges give the luggage more internal capacity, allowing you to pack more. So, in the end, it is up to you to decide which feature you value more. The wheels and the way that they are placed on luggage mean that you have to be aware of certain prior to and after buying these bags. First, because the wheels are attached externally, remember that they add additional length to the bag. So, when looking at the dimensions, check the difference between the length of the bag and the actual capacity of the suitcase or luggage. Otherwise, you may end up with a much smaller bag than intended. Spinner wheel luggage can also weigh a bit more. However, it is important to avoid buying pieces of luggage that weigh more than ten pounds, on average. The more that your bag weighs, the less that you will be able to take with you. When packing your bag, it is important to keep this additional weight in mind. Your baggage and the weight of the bag shouldn’t exceed the airline’s limitations. Remember, while your spinner luggage is incredibly useful, it does have its downsides. This includes the type of surfaces that it can be rolled on. So, when you have your bag with you, it is a good idea to avoid uneven sidewalks, cobbled roads, and anything else that could damage the wheels. So there you have it – all of the information that you need to choose your spinner luggage with incredible ease. Classic spinner luggage and models that haven't yet got enough reviews to be ranked. List ID 50. Images from Amazon Product Advertising API and shop datafeeds.